Science fiction records are always welcome at my place, even if they are not very good. But this LP is good. Maybe the cover is not great, but there is a lot to see. 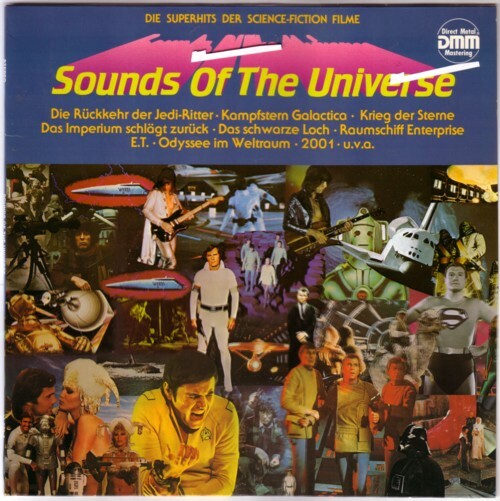 This collection of science fiction film themes is produced and arranged by Les Baxter and Neil Norman. I cannot find any date on the LP, but it must be from the late eighties, I guess. And made in Germany. Les Baxter is always interesting, even if he isn’t. But on this LP he is interesting. He and Neil Norman made disco versions of twelve scifi themes, like Raumschiff Enterprise , Die Ruckkehr der Jedi-Ritter , Kampfstern Galactica and Unheimliche Begegnung der 3. Art . I told you it is a German release, and I would not be surprised if this LP was never released elsewhere. I mean, it is not that good. Here is a composition by mister Les Baxter himself, Das Schwarze Loch . I can’t remember this song was a theme in any movie, and I wouldn’t be surprised if it never was.